If you’re hungry for a taste of this new-fangled virtual reality, Google Cardboard is by far the cheapest (and easiest) way to get in on the action. Sure, it’s not as high quality as something like the HTC Vive, Oculus Rift, or even the mobile-focused Samsung Gear VR or Google Daydream, but it’s still a nice experience for the little investment involved. And best of all, it works with almost any Android phone. First things first, you’ll need a Google Cardboard unit. The cool thing about Cardboard is that it’s basically an entire platform—an open design allows pretty much any manufacturer who wants to get in on the action to build and sell their own Cardboard product (many of which aren’t actually made of cardboard). 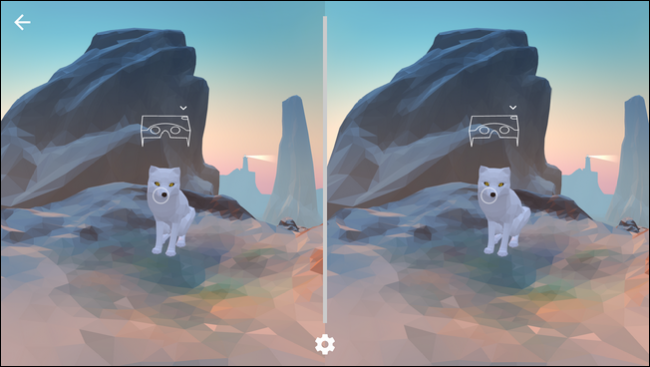 To check out all the options and get one for yourself, check out Google’s Get Cardboard page. You’ll find options ranging from as little as $5 to $70 or more. It all depends on what features you’re looking for. In this tutorial, I’ll be using a basic Google Cardboard unit: a limited edition Kylo Ren Cardboard headset from the Star Wars: The Force Awakens launch. Sorry guys, those are unfortunately discontinued. Either way, the process is the same on all versions of Cardboard, so you should be able to follow along pretty easily. I’m also using a Galaxy S7 Edge here, but again, it’s the same on all devices. 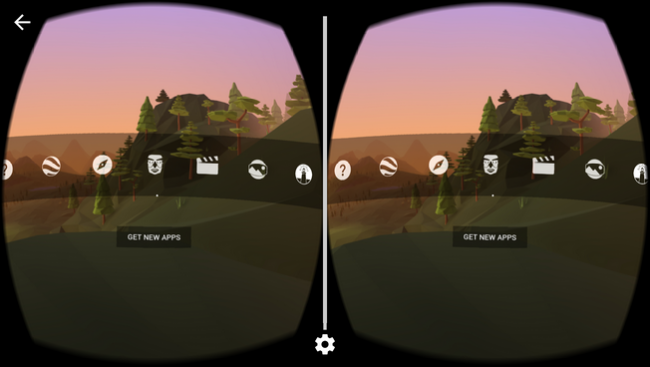 With your Cardboard unit and phone in-hand, go ahead and install the Google Cardboard app. 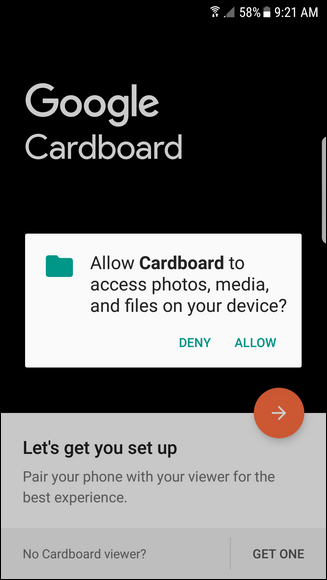 Open the app, and grant it permission to access photos, media, and files. Already, you’ll get kind of a taste of what to expect. The image will move around as your move your phone, so play with it a little bit. It’s neat. Otherwise, tap the orange arrow to move forward (or tap “Get one” to order a Cardboard unit). 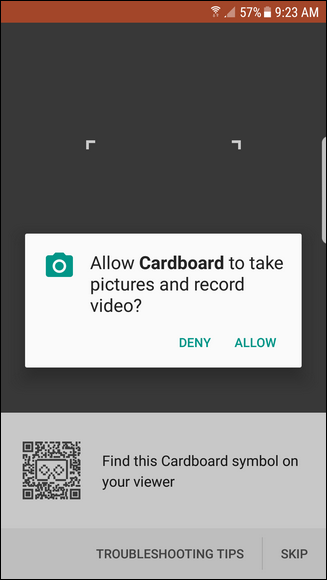 Next, you’ll have to allow cardboard to take pictures and record video, then scan the QR code found on your Cardboard. 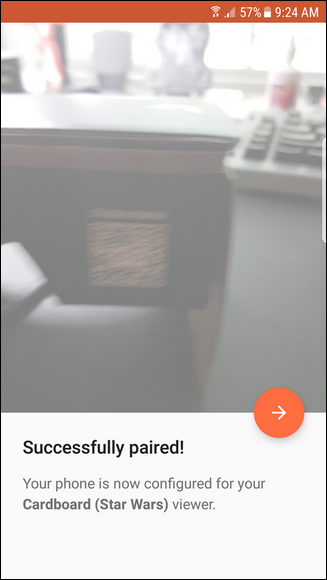 Once that’s successful, it’ll let you know the viewer has been “paired” with the app. Tap the orange arrow to move forward. 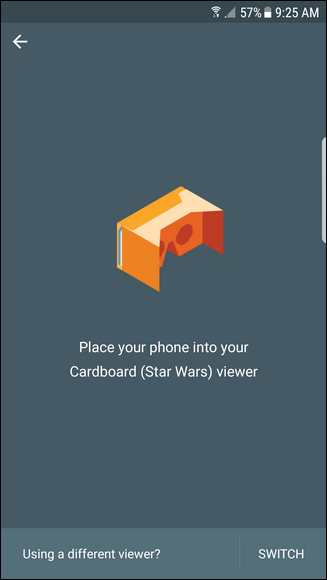 Now it’ll show you how to put the phone into the Cardboard Viewer. Go ahead and do that. A tutorial will start, showing you how to use Cardboard. Lastly, it will quickly show you how to go back before tossing you directly into the main menu. 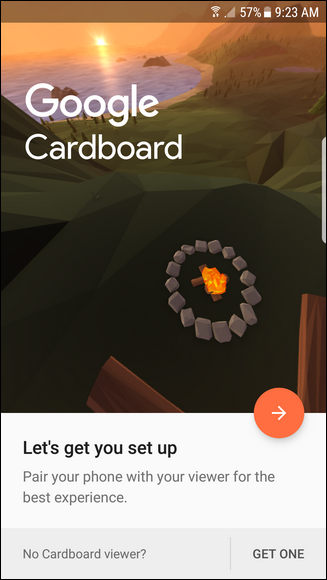 It’s all very intuitive from here—there are links to the various tasks you can do in Cardboard, along with a quick link at the bottom to get more Cardboard apps. At this point, you’re done—just play with it! 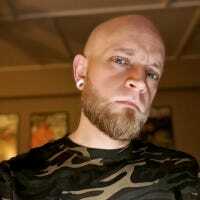 You can find more apps to play with through the Cardboard app.